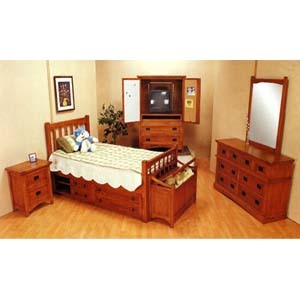 5-Pc Mission Style Oak Finish Bedroom Set. Bed Is Available In Twin And Full Sizes. Inlcudes Drawer Night Stand 3792 (CO), Dresser 3796 (CO), Mirror 3797 (CO), And Chest 3790 (CO). Also Available (Not Included In The Price) Toy Chest 3798 (CO)(Shown), T.V. Armoire 3799 (CO), Computer Desk 3793 (CO), Computer Hutch 3794 (CO), And Chair 3795 (CO) (See Related Items At the Bottom Of The Page). Pieces Are Also Sold Separately. Easy To Assemble. Details: Twin mission bed: Length: 81-1/2 x Width: 42 x Height: 45 / Height: 32 Full mission bed: Length: 81-1/2 x Width: 57 x Height: 45 / Height: 32 Drawer Night stand: Length: 23-1/4 x Width: 16 x Height: 25 Dresser: Length: 56 x Width: 18 x Height: 32 Mirror: Length: 31 x Width: 1-1/4 x Height: 39 Toy Chest: Length: 36 x Width: 17 x Height: 25 TV Armoire: Length: 42 x Width: 25-1/2 x Height: 58-3/4 Chest: Length: 32 x Width: 19 x Height:46. Computer Desk: Lenght: 50 X Width: 24 X Height: 30. Computer Hutch: Lenght: 48 X Width: 17 X Height: 46. Chair: Lenght: 18 X Width: 22-1/2 X Height: 42.